The development of technology to make autonomobiles a reality is well underway. Ultimately, this points to a future where human-driven cars are a rarity. What would that look like? 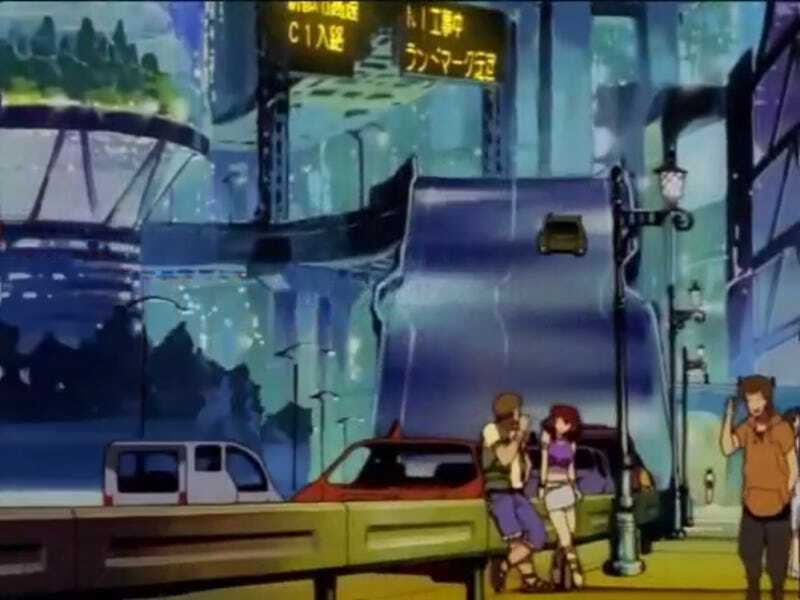 A glimpse into this kind of world can be seen in the 2000 anime series éX-Driver. The story of éX-Driver takes place in the not-too-distant future, where the streets are roamed by driverless cars, such as the “Carrot Motors AI Car”. These can be summoned by stepping up to a kiosk on the sidewalk and selecting your preferred ride, which arrives momentarily. Once inside the vehicle, a voice-activated GPS system asks for your destination and the car takes you there. Just below the windshield, an indicator lamp glows blue, signifying normal operation. If an emergency vehicle approaches, this lamp turns yellow and an override forces the car to pull over. After delivering passengers to their destination, a charging system not unlike Tesla’s snake charger can plug into the vehicle. The autonomous system is not perfect. Under normal circumstances, the detection of a malfunction will trigger the vehicle to pull over. But every once in a while, the indicator lamp on the car turns red, and the car goes AWOL, racing around uncontrollably. This is where the éX-Drivers come in. They are a select few individuals who are recruited to stop runaways. Unlike other citizens in this future society, they have been trained in the art of DRIVING. Behind the wheel of a manually-operated sportscar, the éX-Drivers use their driving skills to chase down the sonuvaglitch in order to get close enough to shoot sensor-fouling foam at the runaway’s four corners. With the sensors disabled, a failsafe stops the car completely, and the passengers can be freed. This series debuted over a decade and a half ago, yet remains impressively relevant to autonomous technology. If you don’t mind subtitles (or can cringe through a halfhearted dub), take a moment to watch the short 6-episode series. It’s good for a few laughs, while delivering a thoughtful take on future transportation tech, as well as some cool animated cars.